The Weather Channel gets back to…. weather forecasts? I admit I am a bit of a weather geek. No I don’t have an anemometer in my backyard or a rain gauge, but I do have a pretty good thermometer that offers temperature, humidity and a short-range forecast. 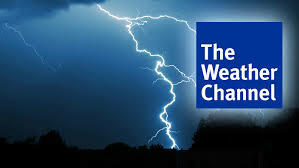 The Weather Channel (TWC) has been around for more than twenty years having first broadcast in 1982. Back in the day I would watch TWC frequently – particularly when a ‘weather event’ was imminent. Recently DirecTV dropped TWC due to a dispute over fees (this is happening more and more frequently). Earlier this month the dispute was resolved and TWC reappeared for DirectTV subscribers. What I also found to be really interesting was that part of the dispute was with Hilton Hotels whichuses DirectTV’s as the provider of service in all its hotels. Apparently Hilton Hotels felt TWC did not show enough weather forecasts. There are simply too many ‘special’ programs about famous (or infamous) weather disasters and significant events. I agree with this as it’s true that whenever I cruise by TWC there is some sort of program on and there are few if any weather reports. There is a scrolling local weather forecast along the bottom but it is far from a weather report. Hotel guests watch channels like TWC for just a few minutes and Hilton Hotels argued that weather programming did not serve its customers as well as old-fashioned weather forecasts. In fact an article in BusinessWeek noted that The Weather Channel has a ‘better filter’. This means it will do more weather. How’s that for a revelation? The big takeaway here is the danger in moving away from your core brand promise. TWC has managed to stay at the forefront of cable and now satellite distribution for a very long time. Brands need to evolve and TWC has made great efforts to stave off what will be an inevitable loss of audience due to the number of options in the marketplace compared to when the channel was launched. Is the idea that after more than thirty years TWC would be called out for not showing enough weather forecasts, comical, stupid or both? This entry was posted in Advertising, Brand Advertising, Cable Television, Satellite Television and tagged brand promises, BusinessWeek, DirecTV, Hilton Hotels and Weather Channel, The Weather Channel. Bookmark the permalink.